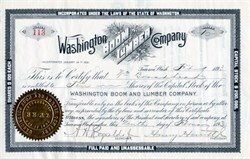 Beautifully engraved certificate from the Washington Boom and Lumber Company issued in 1893. This historic document has an ornate border around it with a vignette of the company's name over a flowering plant. This item has the signatures of the Company’s President, Henry Hewitt Jr. and Secretary, A.H. Reynolds and is over 112 years old. The certificate was issued to William Broadhead and is signed by him on the back. Henry Hewitt Jr., was one of the founders of the St. Paul & Tacoma Lumber Company. He was English born, although he was only a month old when his family left their Yorkshire farm for America. Like Leonard, Hewitt had a bad leg, having been severely wounded when he tripped the wire on a spring-gun while timber cruising north of Green Bay. Unlike Leonard, he was anything but unassertive. He was said to have acquired more pine forest land than anyone in the world except the czar of Russia. Young Henry made Leonard his private secretary. In 1888, Hewitt joined his brother-in-law, Charles Hebard Jones, and partners Chauncey Griggs and Addison Foster of St. Paul to form the St. Paul and Tacoma Lumber Co. They bought 80,000 acres of prime timberland in Pierce County from the vast holdings the Northern Pacific Co. received from the public domain as a reward for building the transcontinental railroad. St. Paul and Tacoma set out to build the "world's largest sawmill" on the Tacoma tideflats. Leonard followed his boss to Tacoma in 1891. On arrival he wrote to his brother, William, from the Tacoma Hotel, marveling at the forested hills stretching back to the mountains -- and at the opportunities offered by the booming town. The partners in St. Paul & Tacoma were investing all around Puget Sound. The company itself bought half-interest in the Wilkeson Coal and Coke Co. Griggs was a major backer of the Tacoma Smelting and Refining Co., which took over Dennis Ryan's under-financed smelter. Griggs also joined the group that bought a floating dry dock at Port Townsend and brought it to Quartermaster Harbor on Vashon Island. All the partners bought stock in Traders' Bank, which had been organized by Henry A. Strong shortly before he returned to his native Rochester, N.Y., to run his new company, Eastman Kodak. Traders prospered and in October of 1892 reported deposits of $950,000. Then came the crash. On June 1, Merchants National Bank closed its doors, the first of 17 Tacoma banks to disappear during the depression. That month, for the first time ever, St. Paul & Tacoma received no new orders for lumber. Traders' suffered no concentrated run on its deposits but withdrawals were steady. By July 20 deposits totaled only $170,000 -- 18 per cent of what they had been eight months earlier. Traders' closed its doors. Addison Foster was appointed receiver. Hewitt, Griggs, Strong and other directors personally pledged that every depositor and creditor would be repaid every penny. By pledging securities valued at $200,000, they were able to borrow $50,000. In January, betting that the depression would ease, they reopened the bank. Times got worse. Again Traders went into receivership. This time the judge appointed 28-year-old Leonard Howarth as receiver. He also became receiver for the Puget Sound Dry Dock Co. and the Pacific Meat Co.
Henry Hewitt Jr., who in 1890 founded the town of Everett, Washington. In 1889, the year Washington became a state. Shortly thereafter, Henry Hewitt, a Tacoma lumberman and investor—with the backing of the wealthy Rockefeller family from the east—formed the Everett Land Company with the Rucker brothers to build the economic base of lumbering, mining and fishing. From 1891 to 1893, important commercial centers formed along Hewitt Avenue, rail service was established and heavy industry took hold. From these early beginnings the development began for a sophisticated harbor facility. Everett was incorporated in April 1893—one year after the founding of the Everett Area Chamber of Commerce—and eventually won a battle with the town of Snohomish to be named the county seat. History from the Tacoma Public Library.